When we throw the pebble in the pond, the ripples formed in water and another most seen example of it is the wave formed in the rope when we shake it. These ripples and upward and downward motion of the rope are a transverse wave. Transverse waves are the waves in which the particles move in the perpendicular direction to that of the wave. The high point is called Crest, and the lower point is called Trough. They can even travel in Vaccum. Let’s analyse the daily life examples of transverse waves. Lightwave is the most significant example of the transverse wave. In these particles travel perpendicular to the direction of the waves. Whenever we throw a pebble into the pond, we can see the circular ripples formed on its surface which disappears gradually. The water moves up and down, and the effect (ripple) moves outward. 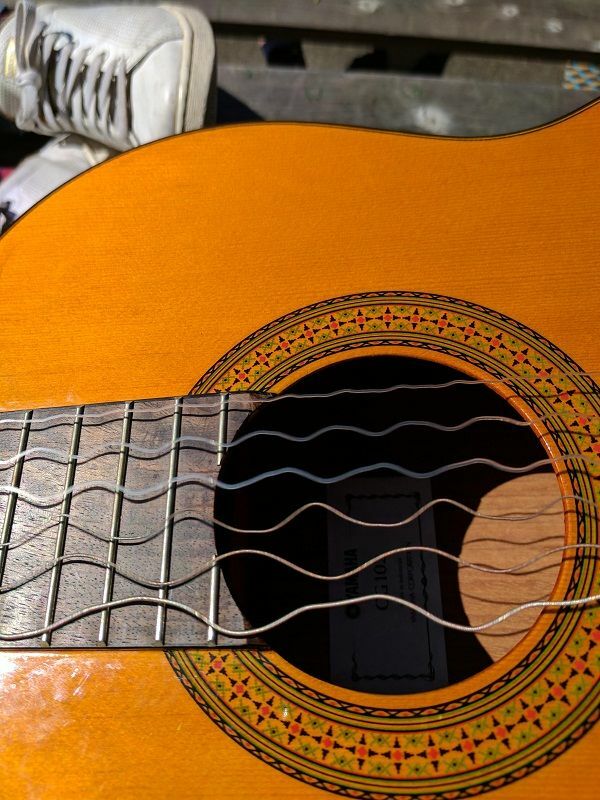 When you pluck the string of a guitar, the strings move up and down, exhibiting transverse wave. The sound wave is a longitudinal wave, but the wave on the guitar is, however; a transverse wave. The particles in the string move perpendicular to the direction of wave propagation. The bump or rattle we feel during an earthquake is due to seismic-S wave. It moves rock particles up and down, or side-to-side–perpendicular to the direction that the wave is travelling in (the direction of wave propagation). These waves are slower than P wave and require solid medium to travel. Though Tsunamis have both the properties of Transverse as well as of longitudinal wave; it starts as a transverse wave. It is transverse from where the earthquake starts under water until it reaches the shore where it turns into longitudinal. We all are well aware of Xrays that most of us have to undergo through it once or more in our lifetime. These are the electromagnetic radiation in which electric field and magnetic field propagates perpendicular to each other. Whenever we are attending a cricket match or any other game in a stadium, the audience usually cheers up their team by standing on their seats. It is sometimes also called stadium waves. We all experience electromagnetic waves daily. These are the transverse waves in which the electric field and magnetic field are perpendicular to each other. These waves are used in Radios, TV’s, Microwaves and Xrays. Most of us have experienced waving a rope up an down, while its other end is fixed. When we pull a rope of string from one end and the keep the other end fixed, it exhibits transverse wave. Last but not least, are the break dancers showing the transverse wave. We all have seen break dancer dancing like worms on TV and cultural fests. These dancers move like a worm; also exhibits transverse wave.